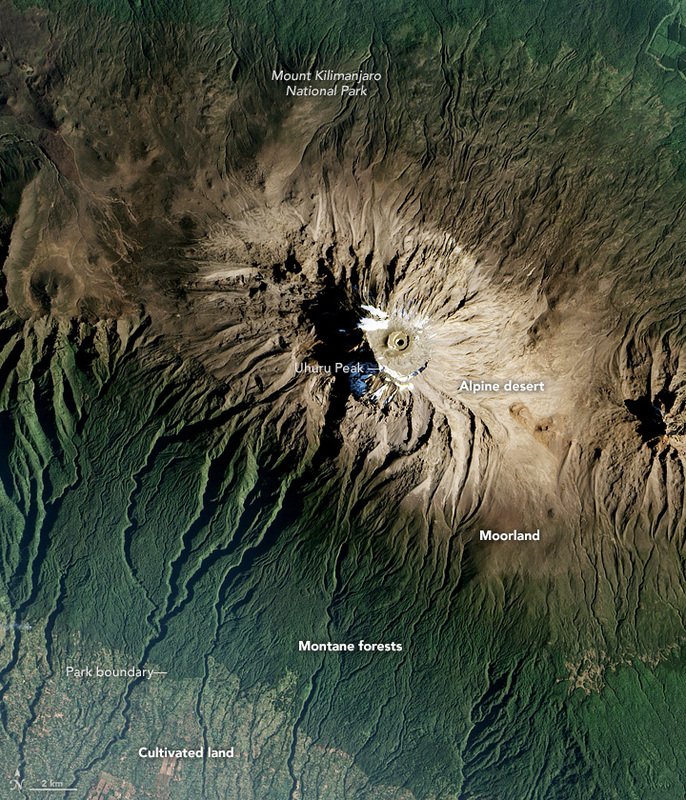 Viewed from a wide, top-down view, Kilimanjaro becomes compelling for a different reason: To get to the icy summit, you must pass through incredibly diverse vegetation zones. 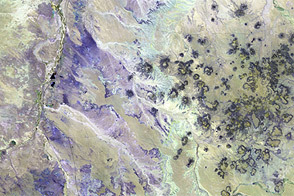 Those zones are visible in this natural-color image, acquired on January 20, 2017, by the Advanced Land Imager (ALI) on NASA’s Earth Observing-1 satellite. The mountain rises 5200 meters (17,000 feet) from the hot, dry savanna, through rainforest and hardy scrublands, to a rocky and icy summit at 5895 meters (19,340 feet) above sea level. 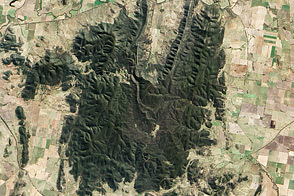 People have cultivated the lowlands ringing the mountain, which appear as patchy green areas in the bottom-left corner of this image. There is little natural vegetation on the foothills. Instead, people have taken advantage of the volcano’s rich soil to grow maize and beans, and to establish home gardens and coffee farms. The continuous dark-green band around the mountain is forest, which stretches from roughly 1800 to 2800 meters in elevation. 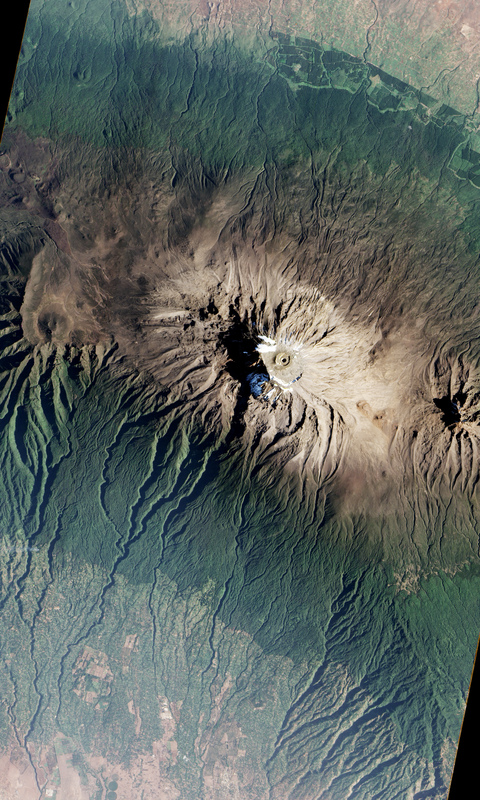 Ground-based researchers have found distinct ecosystems and forest types within this green band, but from space, we mostly see it as the lower boundary of Kilimanjaro National Park. When the park was established in 1973, only small corridors within the forest belt were protected. In 2005, the park boundaries were redrawn to include the more of the montane forests. As we move up Kilimanjaro, the dark green areas transition to a band of green-brown known as the moorland zone. 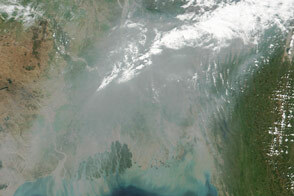 Vegetation still survives here, but it is nothing like the wet, humid forests found at lower elevations. The climate is colder and less humid, and the landscape is full of shorter, hardier plants such as the mountain’s iconic senecios and lobelias. The moorland landscape extends to about 4000 meters, above which vegetation becomes even more scarce. The highest alpine desert and summit zones are relatively inhospitable. But climbers who make the journey are rewarded with an expansive view. The wide view of Africa’s tallest mountain reveals that it is ringed by colorful bands, highlighting the region’s diverse terrain. Hemp, A. (2006) Continuum or zonation? 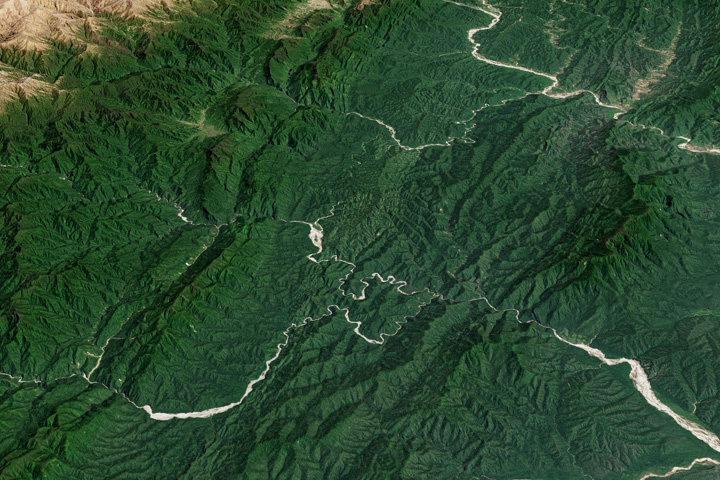 Altitudinal gradients in the forest vegetation of Mt. Kilimanjaro. Plant Ecology, 194 (1), 27-42. 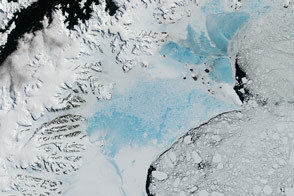 NASA Earth Observatory (2012, November 8) Kilimanjaro’s Shrinking Ice Fields. NOVA: Volcano Above the Clouds Tour Kilimanjaro. Accessed February 7, 2017. Rutten, G. et. al (2015, September 25) Vertical and Horizontal Vegetation Structure across Natural and Modified Habitat Types at Mount Kilimanjaro. PLoS ONE, 10(9):e0138822. Smithsonian Institution: Global Volcanism Program (2013, April) Kilimanjaro. Accessed February 7, 2017. UNESCO World Heritage List (2017) Kilimanjaro National Park. Accessed February 7, 2017.